In two previous posts we introduced the speculation that Modern Humans may have interbred with Neanderthals. these articles are based on Svante Pääbo's quest to sequence the Neanderthal DNA. In our our third installment we have some interesting revelations surfacing as the Neanderthal DNA sequencing continues. The first revelation is both DNA's, Neanderthals and Modern Humans, are nearly identical. 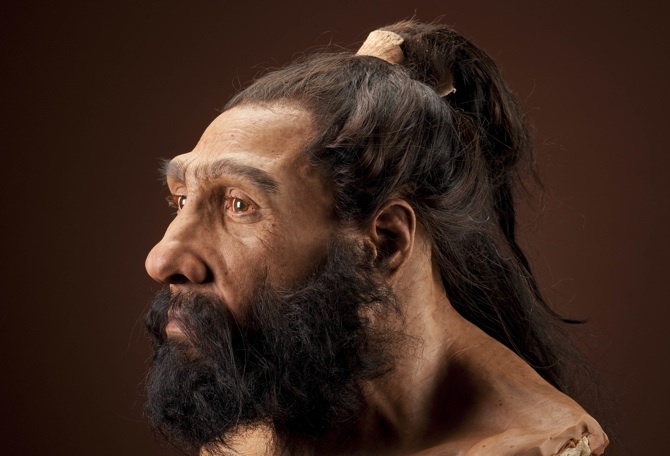 "After years of anticipation, the Neanderthal genome has been sequenced. It’s not quite complete, but there’s enough for scientists to start comparing it with our own. 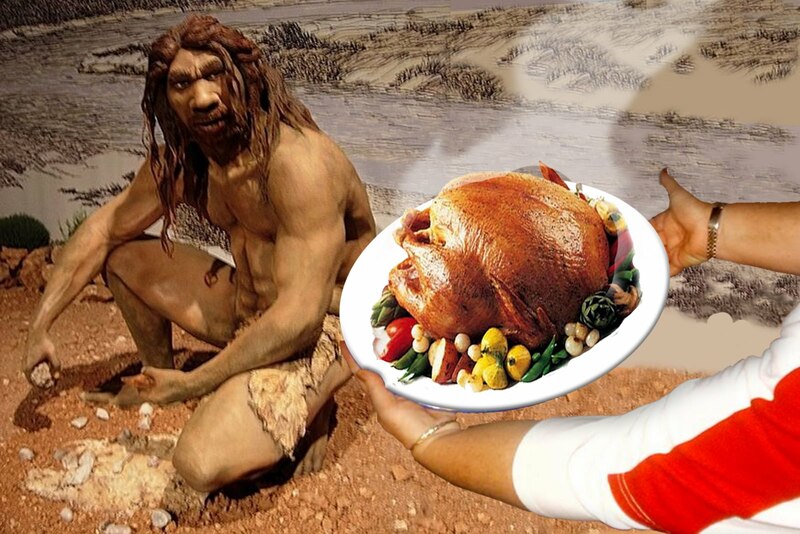 According to these first comparisons, humans and Neanderthals are practically identical at the protein level. Whatever our differences, they’re not in the composition of our building blocks. However, even if the Neanderthal genome won’t show scientists what makes humans so special, there’s a consolation prize for the rest of us. Most people can likely trace some of their DNA to Neanderthals..."
For Bigfooters this is amazing, because we know Neanderthals and Modern humans were both very physically different, but according to the DNA evidence we would never know to what degree without fossil evidence. Its a two-edge sword for Bigfoot DNA evidence. If DNA can be so similar, nearly identical, between two species, it may be hard to distinguish Bigfoot DNA. On the other hand, we may already have Bigfoot DNA and dismissed it because it was so similar to another known species. The second revelation is, according to studies, not all modern humans contain the same amount of Neanderthal DNA. Modern humans with African descent actually have less traceable Neanderthal DNA. ...For people of African descent disappointed that they lack Neanderthal ancestry, Pääbo gave solace. 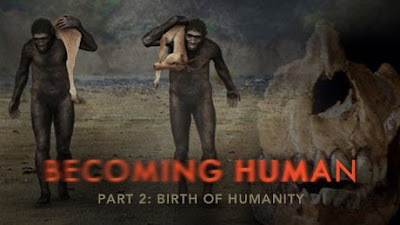 This three-part series, Becoming Human, on PBS’s Nova covers new theories about how and why we evolved into human beings and is well worth watching. You can watch all of the episodes here, as well as view several interesting mini-programs about related topics. This post covers the major idea presented in episode 2, “The Birth of Humanity.” It’s a doozy. 2) Sweating made us human. Okay, bear with me. The big brains we got from climate change needed more food to operate. Our brains use more energy and food than any other organ in our body. To get more food, we turned to meat, which is loaded in calories, protein, and fat. To get meat, since humans don’t have claws, fangs, or great strength, we had to figure out a new way get our meat fix. Scientists now think we turned to persistence hunting, which is chasing the prey until it collapses from exhaustion and then killing it. The Bushmen of Africa still do this, chasing antelopes and other game for several hours in the heat of the day, when most animals are sleeping. It turns out that humans are unique in this capability; we can run for hours in the hottest temperatures because we traded fur for sweating. They think that losing our body hair or fur and gaining the ability to sweat happened at the same time as our brains started to get bigger. Most animals cool themselves by panting. Humans can sweat over their entire bodies which is a more effective method for cooling. Our bigger brains triggered a number of adaptations to support that growth. Because our brains got bigger, we started eating meat, lost our body hair, started sweating, and were able to run down prey for hours at a time. Oh, and our big brains and our new appetite for meat caused us to develop stone tool-making to “process” our kills and fire-making to cook the meat to make it more easily digestible. But the ability to sweat was the big change that enabled everything else. Cool. 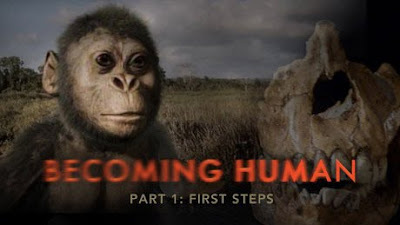 This three-part series, Becoming Human, on PBS’s Nova covers new theories about how and why we evolved into human beings and is well worth watching. You can watch all of the episodes here, as well as view several interesting mini-programs about related topics. Some of the ideas being offered in Becoming Human are fairly new and have a lot of bearing on how we differ from the other great apes and by inference how we might compare to Bigfoot. I’ll cover the major ideas in each of the three episodes and wrap it all up in the final and third installment. 1) Climate change made us human. At one time, it was thought going from knuckle-walking to bipedalism is what triggered the growth of our brains. But there were bipedal apes staggering around Africa for 4 million years before there was a growth spurt in the brains department 2 million years ago, and then it was a upwards growth from then on. Scientists have now linked it to a long period of climate change in the Africa Rift Valley, where the climate swung back and forth between extreme drought and desertification to extreme rainy periods. This went on for a long time and the most successful bipedal apes were the ones that could adapt the easiest to the extreme changes in climate. The ones that could do this were the ones with bigger brains. They could think better with a bigger brain. The longer the climates changes continued, the bigger our brains got. So bigger brains enabled apes to adapt to their changing surroundings and to eventually adapt their surroundings to themselves—big brains, big advantage, big deal.